George Gracious Style was born in Melcombe Regis, Weymouth, Dorset in 1817 and baptised there on 5 November 1817. He was the son of Coach Builder George Style (1794-1858) and Martha Jane née Bowyer (1801-1879). In the 1841 census George and Martha were living in West Street, Melcombe Regis, with their children; Thomas (b1816 and a Coach Builder), 20-year old George, also a Coach Builder, Jethro (b1826), Elizabeth (b1827), Martha (b1829), Sarah (b1833), Charles (b1836) and Henrietta (b1839). On 24 February 1846, at the age of 28, George married Louise Elliott at Melcombe Regis. She was the 23-year old daughter of James Elliott and Mary née Lovell. George and Louise were to have twelve children; Frederick George (b1846), Ann Wallis (b1848), Thomas James (1850-1910), Emily Sarah (1852-1857), John William (1854-1896), Martha Elizabeth (1855-1927), Mary Louisa (1855-1902), Sydney Richard (1857-1925), Henry Frank (1859-1912), Emily Henrietta (1860-1908), George Robert (1863-1908) and Catherine Alice, known as Kitty (b1886). The eldest child, Frederick, was born at Melcombe Regis but then George and Louise moved to Yeovil where all their other children were born. In the 1851 census George and Louise, together with their eldest three children, George's sister Sarah and a house servant, were living at 5 Peter Street. Having taken over the coach works of Mr R Tytherleigh in Middle Street, George listed his occupation as 'Coach Builder - Master, employing 4 men, 3 apprentices'. 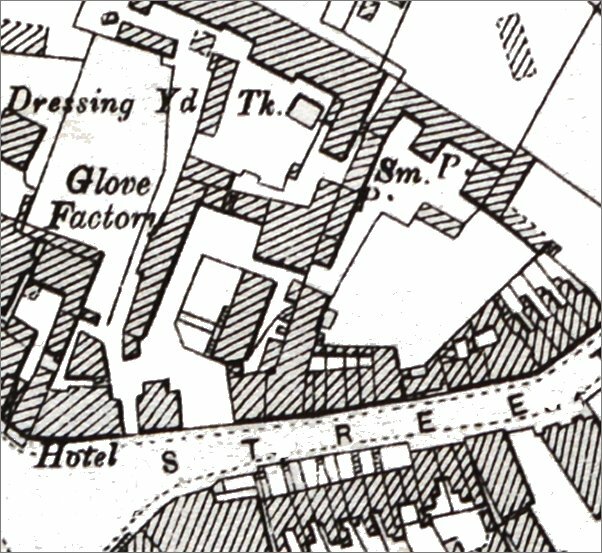 By the time of the 1861 census George and Louise, nine of their children and a domestic servant were living at the Middle Street coach works. George gave his occupation as 'Coach Maker, employing 6 men & 4 boys'. His son Frederick, now aged 14, was listed as an Assistant to his father. The family were still living at the coach works in 1871 with George giving his occupation as 'Master Coach Builder, employing 7 men & 5 boys' and his 20-year old son Thomas was listed as a Coach Builder. 24-year old Frederick, meanwhile, had moved back to Melcombe Regis and in the census was listed at 65 St Thomas Street with his occupation given as 'Coachbuilder Employing 6 men & 6 boys'. Louise died in Yeovil in the autumn of 1871, aged 41 and in the census of 1881 George was listed at the coachworks with three of his children; Emily, George and Kitty and a domestic servant. George gave his profession as Coachbuilder and George Jnr was a Grocer. Frederick appears to be missing from the 1881 census but he reappears in the 1891 census with an Irish wife, so perhaps he went travelling to Dublin? In the 1891 census it is George's turn to be absent although he is listed in the Melcombe Regis Electoral Register of 1890 by virtue of owning a dwellinghouse at Cambridge Terrace. He certainly wasn't at the Middle Street Coachworks where 44-year old Frederick was living with his Dublin-born wife Kate (there were not to have children), his sister Emily and a general domestic servant. Frederick was listed simply as a Coachbuilder. Sadly Kate died, aged 47, in the autumn of 1896 at Yeovil. George had retired to Khyber Lodge, Yeovil (I don't have a clue where that was) and died there on 3 May 1898. His will was proved in June and his effects were valued at £17,407 17s (in excess of £11 million at today's value). By the time of the 1901 census Frederick had moved to Taunton and was living on his own at Gordon Lodge, French Weir Avenue. He still gave his occupation as a Coachbuilder. By 1911, aged 64, he had moved to 12 John Street, Bath, and was working as a Tobacco & Cigar Dealer. Frederick died in the winter of 1924 at Salisbury, aged 71. This map, based on the 1901 Ordnance Survey, shows the Triangle in the bottom left corner with Middle Street running across the bottom of the map. The hotel is the Coronation Hotel, behind which is Whitby's leather dressing yard and glove factory. To the right of the factory is the Style's coach building works, accessed from the archway alongside the hotel and seen in the photograph below. 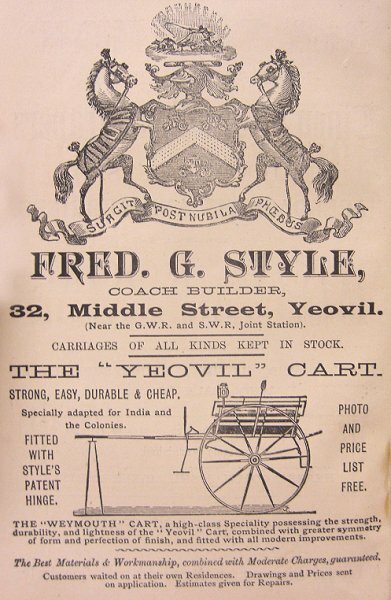 By the time of this advertisement in Whitby's 1891 edition of the Yeovil Almanack Advertiser, 74-year old George had retired and son Frederick was running the business. This is the only mention of the Style's business I could find in any trade directory. 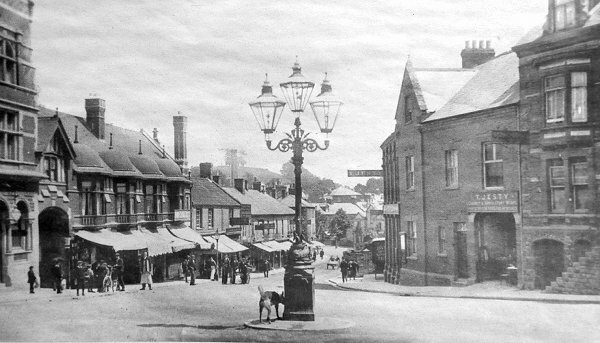 A nice photograph of the Triangle, featuring the triple head Sugg lamp (with suspicious-looking dog), photographed around 1905. At extreme left is the Coronation Hotel and the arch to its immediate right was the Middle Street entrance to the Style's coach works.